Big, Cool Star Wars News! The Clone Wars are over, but for those with reason to run from the new galactic Empire, the battle to survive has only just begun…. The Jedi have been decimated in the Great Purge, and the Republic has fallen. Now the former Republic Commandos — the galaxy’s finest special forces troops, cloned from Jango Fett — find themselves on opposing sides and in very different armor. Some have deserted and fled to Mandalore with the mercenaries, renegade clone troopers, and rogue Jedi who make up Kal Skirata’s ragtag resistance to Imperial occupation. Others — including men from Delta and Omega squads — now serve as Imperial Commandos, a black ops unit within Vader’s own 501st Legion, tasked to hunt down fugitive Jedi and clone deserters. For Darman, grieving for his Jedi wife and separated from his son, it’s an agonizing test of loyalty. But he’s not the only one who’ll be forced to test the ties of brotherhood. On Mandalore, clone deserters and the planet’s own natives, who have no love for the Jedi, will have their most cherished beliefs challenged. In the savage new galactic order, old feuds may have to be set aside to unite against a far bigger threat, and nobody can take old loyalties for granted. Pre-order your copy here for those in the States and here for those in Europe! Next up, the incomparable Timothy Zahn returns to the Star Wars Expanded Universe! Bestselling author and fan-favorite Timothy Zahn will return to the Expanded Universe of Star Wars novels with a new full-length story to be published by Del Rey Books in 2011. The new tale of intrigue and action is set in the time of classic Star Wars trilogy, not long after the events of his previous novel, Allegiance. The legendary heroes return — Han Solo, Luke Skywalker, Princess Leia and Chewbacca — along with some of Zahn’s most popular creations: Thrawn, Mara Jade and the Hand of Judgment stormtroopers. The book is as yet untitled, but is slated to debut in fall of 2011, the year that marks the 20th anniversary of his first Star Wars novel, Heir to the Empire, the blockbuster book that launched the modern era of Star Wars publishing. Star Wars Imperial Commando: 501st Blurb! 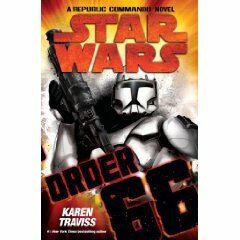 I saw this on theforce.net a few minutes ago and thought I’d post it here – but beware, if you haven’t read Karen Traviss’ Republic Commando series (Hard Contact, Triple Zero, True Colours, Order 66) and don’t want to be spoiled, DON’T READ THIS! 🙂 You have been warned! This is a blurb for the book from amazon.uk, and remember, it might not be the actual blurb that’ll appear on the book. The Clone Wars are over, but the clone deserters’ personal battle against the Empire has only just begun. With death warrants on their heads, and a hated Imperial garrison on Mandalore, Kal Skirata’s clan of clone veterans, Mando mercenaries, misfit refugees, and a renegade Jedi find all their worst nightmares have followed them home. The search for a cure for the clones’ premature aging grows more desperate, and Etain’s son must be protected at all costs. Darman and Niner are still stranded in the Imperial legion, and fight to survive in a very different army. But as Mandalore prepares to resist Palpatine’s new order, Skirata is forced to give safe haven to those he hates most, and some he thought were dead. Clan Skirata thinks things can’t possibly get any worse – until their ragtag private army faces the reality of fighting the Empire. Their most lethal enemies are now their own brothers. PS. I’ll post the cover art as soon as it’s available! Order 66 was an incredible book. I’ve been following Karen’s adventures in a ‘galaxy far, far away’ since her first Republic Commando novel, Hard Contact, as well as the brilliant work she’s done in the Legacy of the Force series, and I can honestly say that she has become stronger with each book! At first, it was a bit strange for me to be immersed in a Star Wars universe that was grittier and darker than what I was used to, but I had been prepared for that by The New Jedi Order series – and I still think that it would have been insanely brilliant (instead of just brilliant) if Karen Traviss could have been a part of that series. Why do I say that? Well, the power of Karen’s characterization, for one. It seemed a wonderful case of serendipity that I had read GRRM’s fantasy epic before reading Order 66, because it became clear to me that Mr Martin has some major competition in the living-and-breathing-characters department. Karen is amazing at getting you into the heads of her characters! Whether they be Jedi, Commandos, Mandalorians, or even Strill ( 🙂 ) Karen leaves you with the feeling that these beings actually live and breathe somewhere, that you know them intimately, and just as that knowing them keeps you reading, she can still surprise you with how the characters react – but they still react in ways that are true to who they are. But did you know that Jango arranged for select numbers of the clones to be trained by Mandalorians? We’ve seen these clones before – they are the ARC (stands for Advanced Recon Commando, Master Kenobi) troopers in the Clone Wars cartoon, and they guys from the First-Person Shooter Star Wars Republic Commando. These kids were almost ‘terminated’ by the Kaminoans because they were failures – they didn’t toe the line as the millions of others did, and would have all died if not for some of the Mandalorian Cuy’val Dar (those who Jango had brought in to train the clones) who stepped in and saved them. One of these guys, Kal Skirata, is now one of my favorite non-existant people. Ever. Get Ned Stark and Kal Skirata in a room… man, sorry for Palpatine and the Lannisters! Anyway, Kal saves the clones he can save, and teaches them everything he can that could possibly ensure their survival. Because, you see, these clones are human beings to him; human kids who have been given the very short end of the stick; they have no choice in any aspect of their lives. None. Period. Not only does Kal believe in them, but he treats them as his own sons. Then Geonosis happens, and the Clone Army is thrown into combat. Our two main Commando-groups emerge – Omega Squad and Delta Squad (Delta are the guys from the game), and we follow these two groups through the four books that make up the Republic Commando series. Along the way, we’ll meet the Jedi, and some of them will begin to see just how human these clones are; foundations are shaken and destroyed, let me tell you. If you ever wondered how the Jedi could just use a slave-army and stand for all they stand for… well, lets just say that some of them deserved the culmination of Order 66. But good along with the bad: the books are also populated with characters who you all know – people who are selfless and stand by their convictions, people who love without reservation or judgment, people who reach out a hand to these poor men who fight and die for them. And you’ll be in the thick of the action, too: running battles, suicidal attacks, guerilla warfare, it’s all there. And there are also touching moments, moments where you might just spit out you coffee while swearing or cheering unexpectedly. Every book in this series is amazing! To check out Karen’s website, follow this link (where you’ll also be able to follow links to order the books). And to check out another review of Order 66, read Graeme’s review. Nice to talk to you all in SA! Would you please tell us a bit about yourself? Not much to tell, really. I’ve been writing fiction for a living since 2004. Before that, I was a journalist, and I worked in PR, but as that was political PR, you can probably count that as fiction too. I sometimes wonder if my characterisation skills actually developed as a result of having to make politicians look like reasonable, honest human beings. A few of them really taxed my creativity on that front…. You’ve completed your Wess’har War series (among many other projects): will you please give us an intro to the series? It’s about what happens when humans blunder into a rumbling on-off war between aliens a long way from Earth. Not only do we find we’re not the top of the food chain, we also find that our morality is not the morality of the militarily dominant species, and that they find us pretty disgusting. Inevitably, we screw up badly, and they decide we’re a threat that has to be dealt with. There are no heroes or villains in the series, just different perspectives, the very tight third person point of view of each character, so it’s not a series for readers who like nice clear-cut good and evil. Nor are there any answers in it, because I don’t have any. It’s all questions. The characters that most readers regard as the heroes of the series are a disgraced cop, a war criminal, an alien warlord, and a combat-stressed veteran commando. That tells you a lot. What were the themes that you wanted to explore with the Wess’har War series? All my novels, tie-in or creator-owned, are about the politics of identity. I didn’t have a label for it until a reader who’s an academic pointed that out to me. They’re all about how we identify ourselves and the line between “us” and “them”, the “them” being anything we can treat badly or exploit. It’s all about otherness. You’ll see exactly the same questions explored in my Star Wars or Gears of War books, or anything else I write – it’s something that works in tandem with my tight-third-person POV style. You’re in each character’s head as the books progress, and you only see the world as each sees it, no authorial intrusion, so it’s up to you as the reader to decide who you believe. I create characters (and develop the ones I inherit) using a twin technique that’s a mix of biology and psychological profiling – I ask myself what kind of person would find themselves in certain niches – who would want to take a one-way trip to an alien world? – then work out the psych profile, and let them loose to interact with one another. It’s much more like computer modelling or games than conventional novel techniques, and the characters really do drive the plot to places I not only don’t recognise but also to places where I wouldn’t want to go personally. I don’t bolt a plot of my choice into the characters. That makes for a very different kind of book. I’m an ethicist, a critic tells me, which means I explore all my stories in terms of ethics. I still think like a journalist, of course, so if anyone tells me “These are the good guys,” my instant reaction is, “Yeah? Says who? 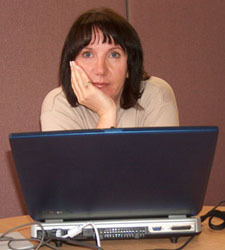 Why?” I don’t take anyone’s word for anything, and I don’t take well to unchallenged assumptions. For example, Star Wars – the vast majority of Star Wars fiction is centred on Jedi, so we just get the Jedi PR view, and nobody sees themselves as bad – not even serial killers. We all think we’re right, and we all think we’re good people. But if you look at yourself, or the Jedi, through someone else’s eyes – someone who hasn’t fared well at your hands, or theirs – then you’ll get a very different picture. So I introduced the idea to SW that the Jedi might not have been the heroes they thought they were. As a journalist, looking at them cold (I knew nothing about SW before I started the books, and I’m not a fan) the Jedi struck me as exactly the kind of cult I’d want to investigate and whose funding and resources would be of great interest, if you get my drift. When I find a “between projects” moment, I’ll let you know. I haven’t had a break since October 2004. I have to have one soon, or I’ll drop. I’ll probably do something like take up gliding or some other thing I’ve never thought about before, just to see what happens. Looking back on your career, is there anything you would have done differently or changed, if you could? Well, there are only four years to look back on, but if you go by the number of books I’ve written in that time, yes, I suppose that’s a lifetime’s writing for most people, so, okay, career. There have been a few books I’ve absolutely loathed writing for various reasons, and at a basic human level I wish I’d never signed on the dotted line. Readers won’t even be able to guess which ones they are, because it never shows in the books; every book is written to utmost of my ability. It’s not actually the books per se that are negative experiences, but the accompanying factors that are actually a bigger part of writing a novel than the writing itself. At a professional level, though, I know that the bad things in life teach you a lot more than the good ones, so they’re necessary. I now understand exactly what I dislike and should avoid doing, so I make better choices about what I do in the future. The negative experiences have also been useful for testing my own judgment – there was one case where my inner voice said, “You know this is going to be a serious pain in the backside, don’t you?”, but I did it anyway, and it was, so I learned to trust my instincts better. I run on business plans – this is business, not art – so I’m used to evaluating outcomes and adjusting plans accordingly, and there’s no point writing if you don’t enjoy it. There are much easier ways to earn a living. The more I define what gives me pleasure in my working day, the better the quality of my life. For example, I know now that I really enjoy working with a games team – I’ve had the time of my life working on GEARS OF WAR with Epic. I also know now that I’m not actually an SF writer – I’m a military writer who happened to start with SF, and the military/ political thing is likely to be the constant in my career, not the genre. You only get to know that by trying things and finding out what you don’t like. You’ve been on many book tours and have had to sign many books: is there any tour that stands out in particular, one that you really enjoyed? Actually, I’ve only done a few, and only in the USA. I love the actual events – meeting readers, giving talks – but I hate the travel in between. The sooner someone invents a matter transporter, the better. I’m still twitching from the Great Chicago Airport Foul-up of 2007, also known as the Voyage of the Damned. I won’t bore everyone with the logistics disaster story, but we (me and artist Matt Busch) finally got to Indianapolis an hour after the event was due to start, and by that time the airline had lost my luggage – and | was due in Florida the next day. The situation was saved by the magnificent folks of the local 501st Legion garrison, who made sure I was fed, took me shopping for emergency supplies and clothing, and generally looked after me. I have the best fans on the planet – bless them. Finally, how do you think the science-fiction genre has changed over the decades, and do you think it has changed for better or worse? I don’t read novels – I don’t read any print fiction other than comics – so I can’t judge by that, or comment on quality, because that’s going to be highly subjective anyway. But I can judge by sales and what I see happening in the SF community. (At least what I see peering through the window, because I’m not part of it, not in the UK or in the US.) I’m disappointed to see what non-media SF has become. It’s dying sales-wise, agents tell me, and I think it’s only got itself to blame; it created its own ghetto and seems to delight in making it hard for casual readers to get in. You shouldn’t have to have a body of special genre knowledge before you pick up a book in order to get something out of it – that’s like setting an entrance exam. But that barrier seems to be there, and so a lot of SF has lost out to SF/ fantasy tie-ins and other media because it’s failed the general reader in terms of creating immersive stories. It’s the kind of attitude I see aimed at TV series like Battlestar Galactica. “It’s not SF!” the hard-liners shriek. Well, I say it is SF and the kind we should be aiming at if we want more people to get into it, because BSG is accessible to casual viewers as well as self-identifying SF fans. BSG is about people and situations we can relate to, and SF is just a stage setting for those things. And “accessible” is not a dirty word – what kind of genre doesn’t want to appeal to as many people as possible? We’re not running an exclusive country club here. We’re seeking a shared experience. I write for general readers, deliberately so, not only because that’s the only way novels will survive in the market, but because I actually want to reach as many people as I can. Believe me, I’d rather write a million-selling book for a modest advance than accept a million bucks for a book that sold to only a couple of thousand readers. Books have to be primarily about people – about characters. The time has long gone when you could trot out a story about a gizmo and the idea of the gizmo alone would make readers gasp. We live in a world stuffed with damn gizmos, our pockets and homes are full of them, and we know what they do and that they haven’t always made our lives magically better. But we still have trouble understanding other people. So that’s where the sense of wonder lies, the unknown country to explore. The worst lie SF ever told itself was that any story where you could take out the science and the story still worked was just “skiffy”, and hence inferior. By all means go on writing “ideas and gizmo” SF, but don’t be surprised if most people don’t buy it. Novels are about the human condition – even if they’re about aliens. Characters – people – are what sell books to most readers..
Well, there we go, Oh yè, I forgot to mention that I still need to read Neal Stephenson’s Anathem too (that is a huge thick book to have waiting!). 🙂 But I’m just blabbing now, and I need to get to work, so cheers! Anyway, before I started this blog, I was on my second read-through of both The Wheel of Time and The Malazan Book of the Fallen: About sixty pages into Lord of Chaos and around forty pages into Memories of Ice. Since then, I’ve read Peter’s debut, Jo’s debut, David’s fantasy, and now I’m reading The Name of the Wind. I’m not even going to mention the author (since if you read fantasy and you haven’t heard of this book yet, you need to push that rock off you and get back to the world 🙂 ), and the book is incredible so far. After that? Well, I hope to have Karen Traviss’ Wess’har Wars series in hand, so I’ll be reading that. 🙂 If I don’t yet have those books, I’ve got a few others waiting (and hopefully more on the way from the publishers), but yè, there’s my plan of action for the next few weeks.